Special delivery coming in! Well, Deadly Delivery to be exact. Retroband, Zectron, and Vilesore sent in this HALLOWEEN 3 PACK details for you all to add some special effect to your collection, with or without Halloween season to be taken into consideration. The D&D trio is back just in time for Halloween. This time taking inspiration from the classic MaBa toys and one of the craziest horror movies ever made. Three all-new figures are coming from the three D&D artists. First up is Pumpkin Boy sculpted by Zectron and cast in Candy Orange resin. Next we have HAG sculpted by Retroband and cast in Witch’s Brew Green. Hand sculpted by Retroband and cast in Witch’s Brew Green semi-rigid resin. Last up is Skull Kid sculpted by VileSore the newest member of the team and cast in Bone Ash Grey. All have been sculpted MaBa style and stand 2 inches tall. Let these toys be a warning for anyone who thinks staying home and watching TV on Halloween night instead of going out to trick or treat is a good idea! Television will rot your brain and melt your face until your head explodes with bugs and snakes! Get ready for the Horror-thon this Saturday with your very own TV! Make sure you wear your mask! Sculpted by Retroband and cast in black resin. 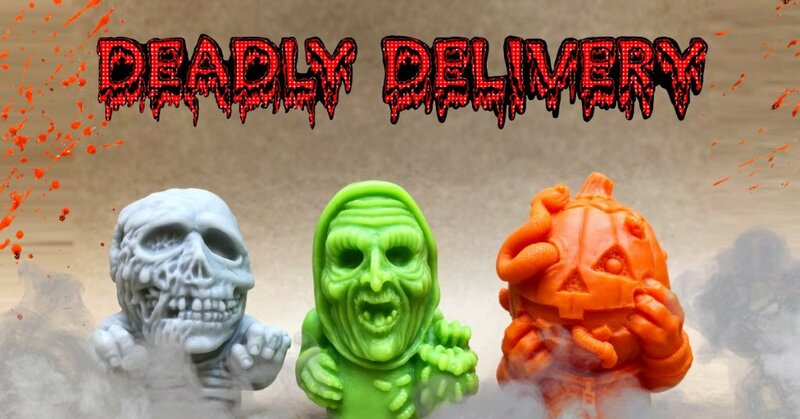 WHEN: All three figures drop this Saturday at 12pm CST so your order should arrive in time for Halloween Night. PRICE: Each three figure set is priced at $75 bucks or you can purchase single figures for $30 bucks each.